UK gamers can already buy the Gears of War games cheaply, says Microsoft, so they're not losing out on anything. The recently announced Gears of War triple pack, which includes the first two games, plus the All Fronts add-on, which contained all the downloadable content for Gears of War 2, will not be coming to the UK, or to anywhere else other than the US, for that matter. Microsoft, which publishes the Gears of War games, said that collection was an exclusive promotion for the US region only. Gamers in the UK already had the opportunity to buy the games at a discounted price, it continued, as both were part of the Xbox 360 Classics range, a budget brand that is almost identical to the Platinum Hits range in the US. Obtaining both games, plus the downloadable material for Gears 2, would cost UK gamers a few pennies short of Â£35, Microsoft said, which is quite reasonable, but isn't anywhere near as much of a saving as the thirty bucks the triple pack will cost. Microsoft's reasoning seems a little puzzling, to say the least. The fact that the Gears games can be picked up cheaply in the UK already doesn't seem to adequately explain why Microsoft wouldn't release the compilation in the country, especially not when you consider that you can buy them cheaply in the US as well. 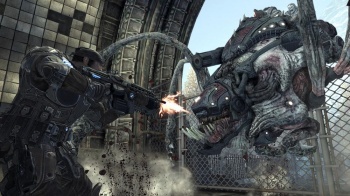 It's possible that that the budget re-releases of the Gears of War games have underperformed in the UK, leading Microsoft to believe that it would see a limited return on the compilation. If that were the case, the publisher might not be in a great rush to admit it. The Gears of War Triple Pack comes out for Xbox 360 on February 15th.